Once again it was Marc Marquez who set the pace in Free Practice 1 in Texas, the Spaniard leading the way from Lorenzo and Iannone. MotoGP™ riders roared into action for Free Practice 1 at the Red Bull Grand Prix of the Americas under a glorious Texas sun. There were a number of developments before the session even began, Valentino Rossi’s (Movistar Yamaha MotoGP) second machine was fitted with the fuel filler in the rear. Yamaha had experimented with this towards the end of 2015 and throughout the 2016 pre-season, but ruled it unnecessary after Michelin improved the front tyre. By shifting the filler cap to the rear of the bike and thus moving the fuel tank itself back slightly, the weight of the bike is shifted towards the rear. Both the Desmosedici GP machines in the Ducati Team were boasting double winglets once again, the Circuit of the Americas a circuit with many heavy acceleration areas. One function of the Ducati winglets is to help stop the bike from wheelieing, which often occurs under heavy acceleration. Although the sun was beating down, the track was not yet quite up to temperature and riders started the session on the softer option tyres. 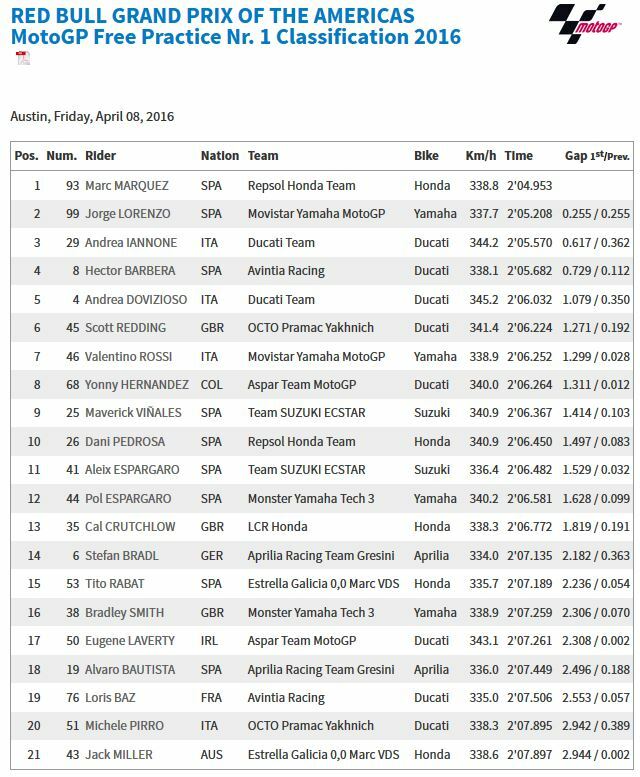 Unsurprisingly it was Marc Marquez (Repsol Honda Team) who topped the session, the Spaniard having won every race at the Circuit of the Americas from pole and has rarely missed topping a session. The factory Honda man was the only rider able to lap in the 2’04s, setting a 2’04.953 to lead by over a quarter of a second. Marquez also debuted a new set of bigger winglets on his Honda during his final run. Jorge Lorenzo (Movistar Yamaha MotoGP) was second and the only rider able to get within half a second of Marquez. 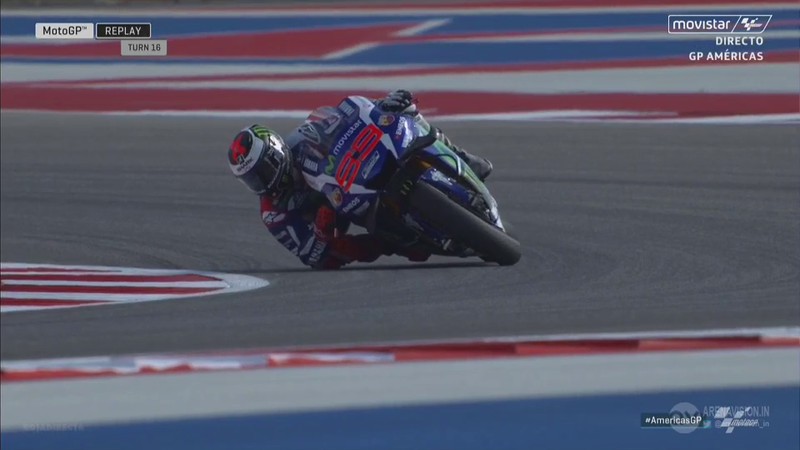 This is almost an ideal start to the weekend for Lorenzo as both he and Yamaha have classically had huge difficulties at the Austin track. Making it three different manufacturers in the top three was Andrea Iannone (Ducati Team) on the Ducati. A 2’05.570 saw him 0.617s back on Marquez and 0.362s behind Lorenzo. Iannone had a slight technical problem towards the end of the session, the Italian’s bike smoking from the belly pan due to a small fire, a result of the fairing being too close to the exhaust. His team quickly dealt with the problem and he was able to return to track soon after. Hector Barbera (Avintia Racing) and Andrea Dovizioso (Ducati Team) rounded out the top five and made it three Ducatis in the top five. The Italian machine has classically gone well at COTA, the heavy acceleration zones handled with ease by the grunt of the Bologna made engine. Barbera was one of only three riders able to get within a second of Marquez, Dovizioso 1.079s behind. Scott Redding (Octo Pramac Yakhnich), Valentino Rossi (Movistar Yamaha MotoGP), Yonny Hernandez (Aspar Team MotoGP), Maverick Viñales (Team Suzuki Ecstar) and Dani Pedrosa (Repsol Honda Team) made up the top ten. There were a total of five Ducati machines inside the top ten, the most of any manufacturer. There was a heavy high-side for Jack Miller (Estrella Galicia 0,0 Marc VDS) at Turn 18. He was taken to the circuit medical centre for further checks on his feet during the session. There were no breaks found in Miller’s foot and he plans to head back out for FP2. Marc Marquez has never los at the Circuit of the Americas nor started off pole, can he keep the streak alive? Having qualified in pole position and won all three MotoGP™ races held at the Circuit of the Americas, few would look past Marc Marquez for victory on Sunday. His victory streak runs further than that when looking at all American circuits, Marquez having taken victory on seven straight occasions in the USA. The numbers might be in his favour, but Marquez knows it will be tougher than that in Austin. COTA is a circuit where acceleration is king; unfortunately one of the Honda’s weakest area is acceleration. After Friday the Repsol Honda Team will have a much deeper understanding of the situation and can begin to improve it if need be. Argentina proved that both Marquez and the RC213V are still more than capable of winning, dominating the race by over five seconds. Victory also gave Marquez the championship lead, the Spaniard sitting on top of the table with 41 points, eight points ahead of Valentino Rossi (Movistar Yamaha MotoGP) in second. With Yamaha riders having classically struggled in Austin due to the strain put on the front tyre, this rounds presents a potentially perfect chance for Marquez to open his lead further.